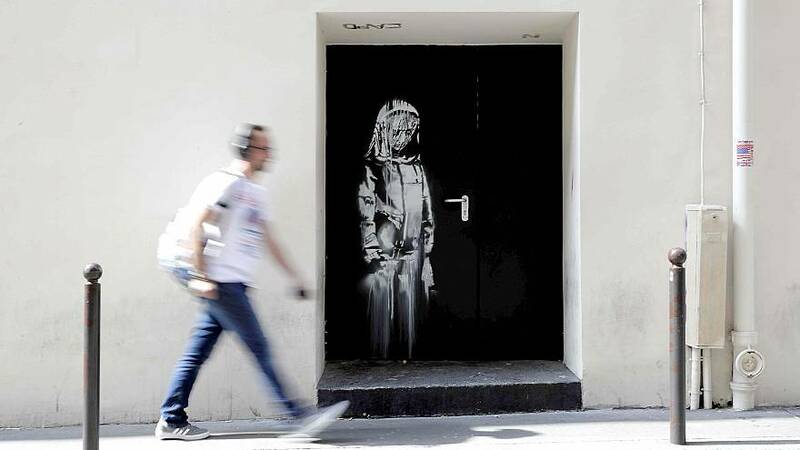 A Banksy mural painted on a door of the Bataclan in Paris to honor victims of the November 2015 terrorist attack was stolen, the theater said in a post on Facebook. The Bataclan said it was outraged over the theft of the painting, which depicts a veiled female figure looking at the ground in a mournful pose. The black and white mural was unveiled in June 2018 on the theater's fire door, three years after terrorists stormed the venue during a rock concert as part of coordinated attacks in and around the French capital that left more than 120 people dead. Ninety of those victims died at the Bataclan when gunmen linked to ISIS opened fire during an Eagles of Death Metal gig. "Artist Banksy offered this work of art on the Bataclan emergency exit door for a reason," the theater wrote in a translated Facebook message, saying the mural was a "momentum of tribute and support." "The very essence of urban art is to give life to a work of art in a particular environment and we are convinced that this work only made sense in that place, that is why we wished to leave it, free, on the street, accessible to all." Authorities in Paris believe thieves with a van stole the door on Friday night, Reuters reported, citing a police source.